Cemetery records are a favorite resource, and for good reason. They’re among the oldest and finest sources of family history information available—often containing clues to long sought dates, family relationships, military service and much more. There are thousands of cemeteries throughout America. They fall into dozens of categories including religious, fraternal, family, national and private family sites. Some cemeteries are situated on a fraction of an acre while others cover hundreds of acres. 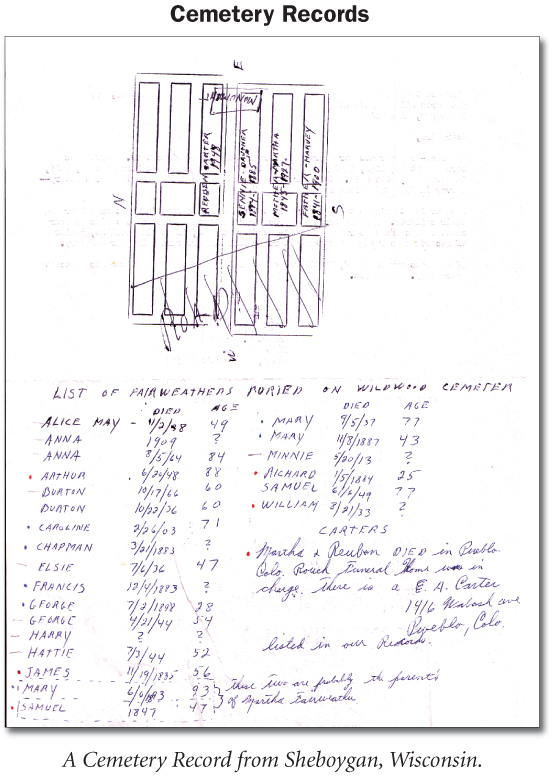 There seems to be little relationship between the size of a cemetery and the neatness or availability of its records. The caretaker in charge of the cemetery, and its records, is the sexton. He’s the one you’ll write to and ask for all the information his records contain pertaining to your family. He generally keep records of the names and dates of those buried and maps of the burial plots. TIP: Cemeteries sometimes have a “perpetual maintenance plan” where, for a single or annual payment, flowers will be put on the gravesite, the grass will be cut, etc. A distant relative (that you might not be aware of) could have signed up for this, which would lead you to another branch of the family who might have valuable information. In many cases, an older relative might be able to tell you where the family was traditionally buried. If not, then death certificates, obituaries, death notices, and wills are all good starting points for identifying the cemetery. Once you know the name of the cemetery, you can get the address via the Internet or a county library. You never know what kind of records they might have. It can range from none, lost, minimal or amazing. If a cemetery does not have an office, a local funeral director may be able to tell you who the record keeper for the cemetery is. 1) Check the FHL Catalog for the County or Town where your ancestor lived for any published cemetery records. 2) Check the Internet for any published cemetery records for your ancestor’s locality. 3) Check with local genealogical and historical societies.